[TUTORIAL] INSTALL AND CREATE AUTOMATED BACKUPS ON UBUNTU WITH RSNAPSHOT – kifemachine.com // its just kife. As I dive deeper into server administration and working with linux it has become more and more apparent that it is important more than ever to have backups of your data. Especially if you are hosting on servers from the LowEnd market. [Lowendtalk/Lowendbox] There are times where I have experienced data loss whether it be at the hands of the provider or my own doing and to start from scratch is just a pain. 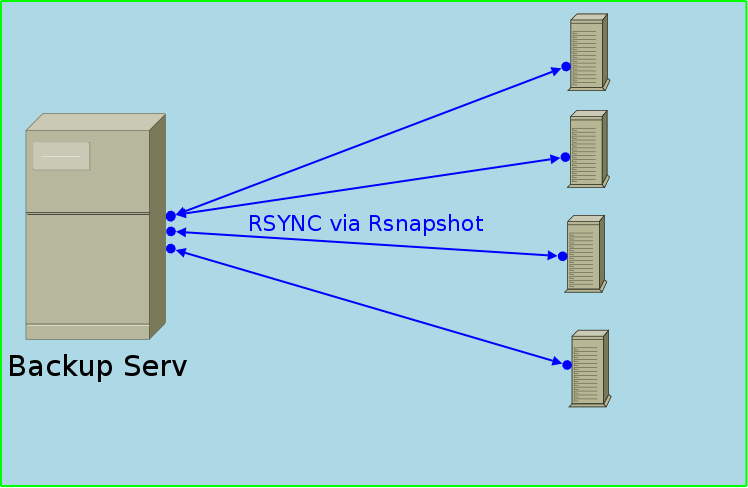 Here is a simplified tutorial on how to set up / install and use RSNAPSHOT a incremental backup tool utilizing rsync to easily create and transfer backups to a remote location on Ubuntu completely automated. The first step in getting your content backed up is to install rsnapshot on the machine that you would like to use as your backup server. After you have installed rsnapshot, you will need to edit the configuration file. **note** One thing to keep in mind while you are working with the rsnapshot configuration file is that each directory needs a trailing slash (/) to be read correctly. The first decision you will need to make is where you would like to store your backups. We will use the directory “/backup” as our backup location. Search for and edit the following variable to set the backup location. If this directory does not already exist, rsnapshot will create it when it runs. You will also want to uncomment the cmd_ssh line to allow for remote backups. Remove the “#” from in front of the following line so that rsnapshot can securely transfer your data to the backup server. Remove the “#” from before the cmd_du line to enable accurate disk usage reports. Next, we need to consider how many old backups we would like to keep. Since rsnapshot uses incremental backups, we can afford to keep older backups for awhile before removing them. Another item that may need to be edited is the ssh_args variable. If you have changed the port number on the server you are backing up, you’ll want to uncomment the ssh_args section and use the same settings here. Finally, you’ll need to decide on what you would like to backup. If you are backing up locally to the same machine, this is as easy as specifying the directories that you want to save and following it with “local/” which will be a sub-directory in the snapshot_root that you set up earlier. **note** when entering these use TAB for spacing do not insert spaces as that will cause errors later on but the test config will help you catch it quickly. For example we choose to backup the home directory and the etc directory on the local machine, the lines we will enter will be as follows. **note** by default both lines below are uncommented if you do not need to create backups either comment them out or delete the lines. If you are backing up a remote server, this can be configured here too. You just need to tell rsnapshot where the server is and which directories you would like to back up. You’ll want to change the “server.com” portion with the IP address or domain name of the server you wish to back up. After your server name/IP address, you need to put a colon “:” followed by the directory path you would like to back up. The “remote-server” portion is the sub-directory where backups will be stored in the /backup folder. You can name it whatever you’d like; I typically name them by hostname for ease of keeping track of backups. We are now finished with the initial configuration of rsnapshot. Save the /etc/rsnapshot.conf file before continuing. If you are using nano to edit, press “Ctrl-X” to exit and answer “Yes” at the prompt to save changes. If your file is error-free, you will receive a “Syntax OK” message. If you did not receive this message, you need to go back and fix the mistakes that it tells you about. Next, we want to perform a dry run of one of the snapshot to make sure the backup process is working the way we want it to. We will use the “hourly” parameter because hourly backups are the basic snapshot type that the other intervals will build off of. Check if the generated output looks correct you can remove the “-t” option to try your setup for the first time. This will run the backup that we setup in our configuration file. For this tutorial, rsnapshot created a /backup directory and then created the directory structure under it that organizes our files. Verify the files were successfully backed up to the specified folder. With rsnapshot working correctly, the only thing left to do is to schedule it to run at certain intervals. For this we will use cron, a linux scheduler, to make this happen. Luckily, rsnapshot includes a default cron file that we can edit to our liking. We’re going to edit this file with nano again. The scheduling is currently commented out. We’re going to remove the “#” character from the beginning of the scheduling section to activate these values. It is important to stagger your backups and run larger backup intervals first. This means running the monthly backup first and progressing to shorter intervals from there in order, as we’ve done in this tutorial. This is necessary so that the program does not get caught up trying to do multiple backups at the same time, which can cause problems.